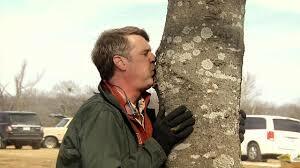 Have you ever watched the Tree House guy on the Animal planet channel? If not, your life is incomplete! There is not a more delightful, wacky and charming real person on TV. Pete, the originator of the Tree House show travels around the country building the most creative and beautiful tree houses you could imagine. It is hard to put into words the feeling that he invokes from his viewers and customers. He is a naturalist, an environmentalist, a humanist and an amazing designer. 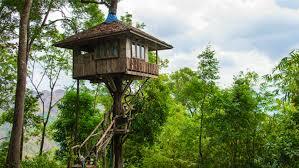 In the show, after he finds the trees “that talk to him”, he sits down for an hour and creates the most incredible tree houses you can imagine. He brings his crew in and in a relatively short period of time they recreate dreams for an awaiting customer. No doubt most of these creations are not in reach of us poorer folks but the emotion that he creates in his art is infectious! 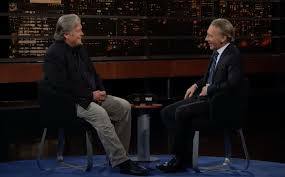 On the other side of my two favorite media people is, believe it or not, Bill Maher. Many people do not have access to Bill because he is on HBO, and that costs more money to watch. Others do not watch him because of his sometimes foul language and irreverent behavior or disdain for religion, but I watch him because his guest are very intelligent people from all sides of the issues and he conducts very informative and honest interviews. The reason he is on HBO and not one of the major networks is because of this very fact; he speaks the truth! He was fired by ABC because he made comments about the 9/11 attack that offended some people. To paraphrase, he said the terrorists were very bad people but he could not say they were cowards since they gave their lives for their cause. Every week Bill comes on and says the things that no one else will say. He says things that many of us think but are afraid to admit to, let alone say out loud. Bill has become the conscience of our culture, sitting in the back of the room reminding us who we are and what is real and what is unreal. In many ways Pete and Bill have the same goals in mind; they each want us to enjoy our lives and open our eyes to the beauty that is in this world. They want us to see what is possible if we are capable of dreaming of a better world. Pete, with the beauty of nature and the creativity he exudes, and Bill with his words on what we need to change to make this a better place for all of us to live peacefully, are both national treasures. Hats off to both these guys! Do you remember the frog story? 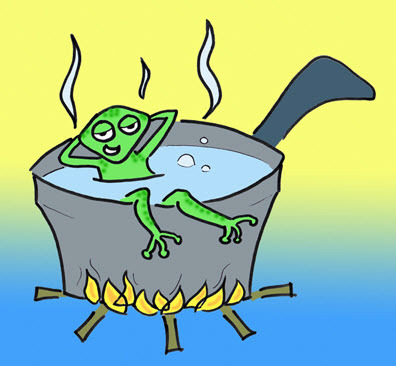 If you placed a frog in water and slowly raised the temperature of the water, the frog would stay in the pan and eventually be cooked. In a similar vein, no one mentions in the frog story that if you say dumb things to people for a long enough time, they may in time become dumb! I do believe we are in this situation now! We are being boiled in stupidity! The outlandish tweets and statements that I hear every day are killing my brain. Just yesterday I received one of those hate Obama posts that made some statements that I knew were false. I tracked down the real Obama speech and listened carefully to it and there were his words, which were cut and pasted to create an entirely opposite statement than what the President said. Who does this stuff? I am sure the dems have done some of this stuff as well, but the total reversal of what Obama said was created in the video. I wonder if it is the Russians or just crazy people in the states? Who ever it is, it is creating an environment of total distrust and misinformation! Like the frog, we can not survive as a country with this type of pervasive distrust boiling in every part of our lives. I do believe that this is in fact the Russians, and they have taken advantage of our first amendment, the freedom of speech, and inundated us with barrages of lies and twisted facts. This leaves us, the American citizens, unable to determine what is true and what is false. Take Hillary for example, she has been involved in many amazing programs for the American people, including the CHIP program, (Children’s Health Insurance Program), and the Violence Against Women Act , but many people in this country believe she is an evil villain. Her worst crime, if you consider it a crime, according to her detractors, is sticking with her husband. The man has some deep emotional issues stemming from a crazy childhood which led him to do some not-so-nice things, but many people believe he was one of the premier presidents in our history and Hillary stuck with him despite his flaws. I thought this is what the religious right believed in. I think there were some folks in the republican party and maybe even the Russians who feared Hillary would become president and spent the better part of a decade destroying her image. Despite several investigations on Benghazi and the email scandal, nothing was found that warranted any legal actions against her. It is almost as if they had future information that Hillary would be president and enacted a tsunami of attacks on her accomplishments and character to change the future.